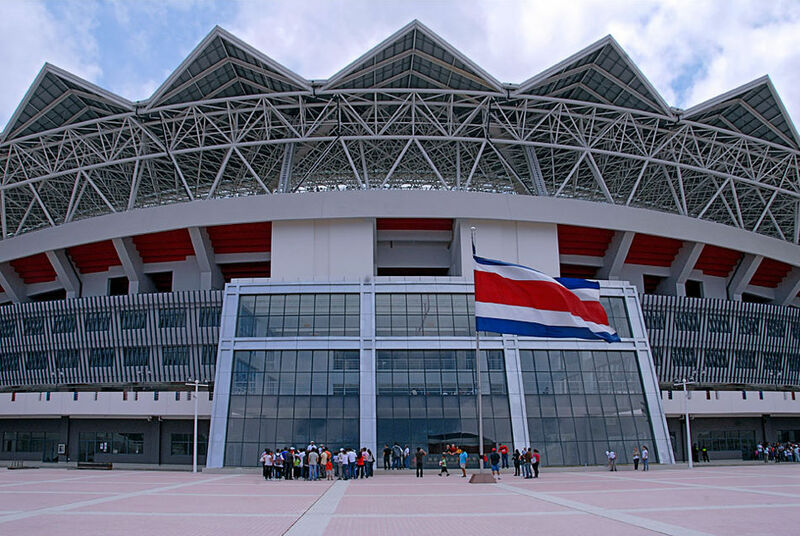 National Stadium Debuts in Costa Rica Today, but not without Controversy! Tens of thousands of people will be on hand for the inauguration of the new Costa Rican National Stadium today (known locally at the “Colosio” or “Coloso” or “Estadio”), the most modern stadium in all of Central America. Many more spectators will be glued to their television sets at home or visiting the nearest Sports Bar or local watering hole, to take in the day’s events that begin in the afternoon and end with the highly anticipated friendly soccer match between Costa Rica and China. brought in to remove the old national stadium and make way for the new construction in La Sabana Park, to the west of Downtown San Jose. 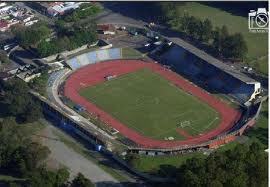 The old stadium unceremoniously closed its doors for the last time on May 11th, with the last soccer game held between the University of Costa Rica and a favorite local team, the Brujas F.C. Fifty five days later, after the first swing of the wrecking ball, the old stadium was reduced to a pile of rubble. The plans for the new stadium for a capacity of 35,000 to 50,000 was officially announced in October 2008, and in December the Chinese construction firm, AFEC, was given permission to take the reins in building the new stadium. Chinese workers and the first materials and equipment from China were brought in beginning February 2009. 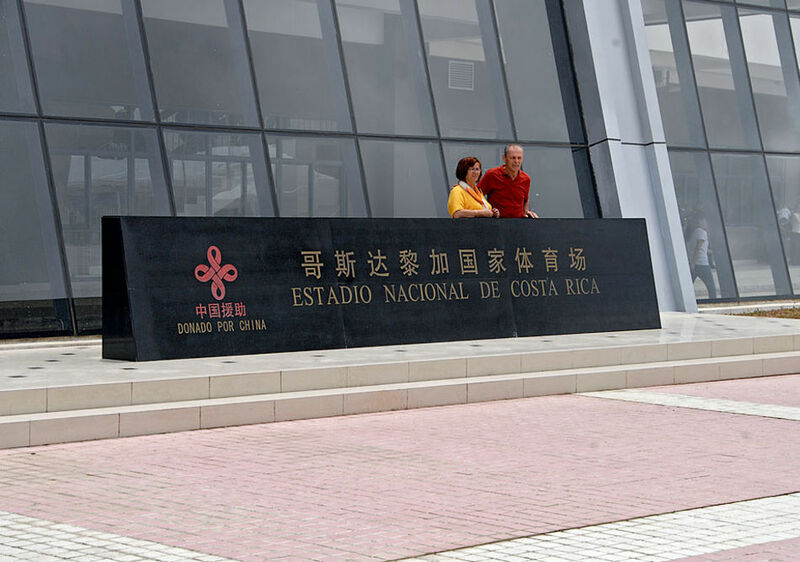 Not without controversy, many Costa Rican labor laws were bent (or broken) to allow this new Chinese workforce to enter Costa Rica and build this fabulous stadium, all that are enforced on already established businesses within Costa Rican borders. 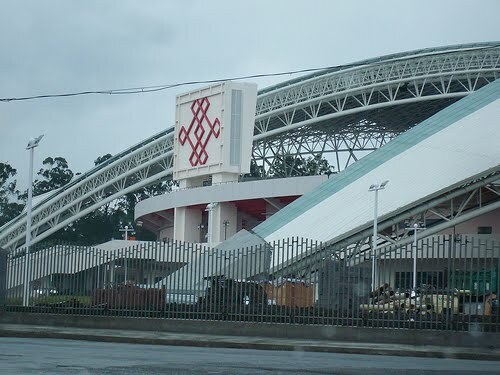 The fact that while snubbing the strict labor laws there were more than enough “Ticos” without work at the time (remember it is/was the recession), or that the majority of the materials used to build the stadium were brought from China, meant that little of this work would immediately effect or stimulate the Costa Rican economy in any way. But then did we really think we would get this Stadium for free as announced? But then again, NO “Tico” project has ever been able to boast an accomplishment like that of the Chinese, one that astonishes those of us that live in Costa Rica, as on November 12, 2010, only 2 short years after officially announcing the building of the new Stadium, AFEC (the Chinese Company) delivered the almost finished stadium to the hands of now Ex-President Oscar Arias. Some three months ahead of schedule!! Alelujuah to the Chinese, you have definitely won our admiration!! stadium began, as the official March opening was announced, and plans were made to host some of the world’s finest musical & sports talent, among other entertainment planned for the inaugural event. That day has finally come……..March 26th, inauguration day is here!! help understand, in 2007, Costa Rica and China established formal diplomatic relations after years of Costa Rica working directly with Taiwan. Then president, Oscar Arias, promptly ditched the country’s long-term monetary benefactor, Taiwan, in favor of its far wealthier and more powerful neighbor, China. 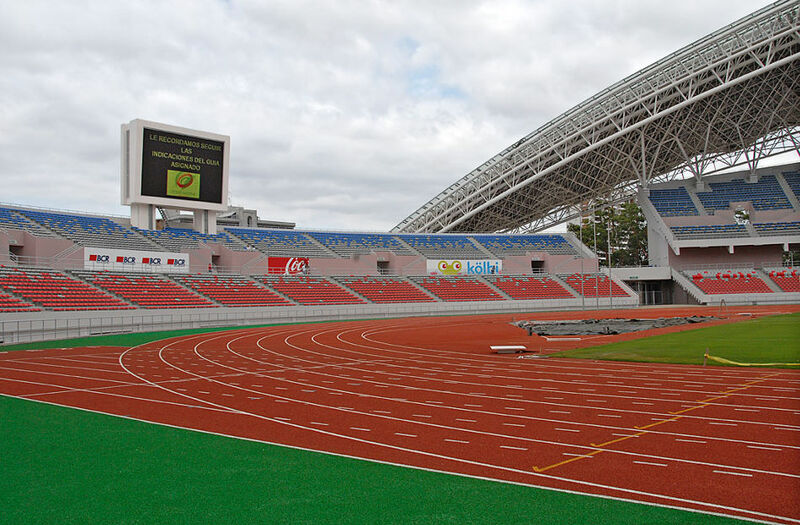 The “Friendship Bridge”, as well as many other educational, infrastructure, security and other Taiwanese financed projects in Costa Rica were quickly forgotten when China promised to build Costa Rica a brand-new national multi-purpose stadium, the most modern in all of Central America. Meanwhile, locals in Costa Rica have already renamed the Taiwanese-built bridge… “Puente de la Apuñalada” (Back Stab Bridge)! construct or repair (note I didn’t use the word “finish”), such as the Caldera Highway which took 34 years to plan and create (and continues to undergo repairs & closures), the Costanera Hwy (43 years, but mostly “finished”), our National Bridges, reconstruction of the Platina Bridge, replacement of infrastucture after the Cinchona Earthquake, etc, etc, the building of the New National Stadium was an impressive example of how quickly a major project can be completed when the right work force is employed, the normal government bureaucracy is shelved, and funding isn’t an ongoing problem, with ongoing cost overruns. It is most definitely proof of what the Chinese Culture of hard working, honest people is capable of doing! Again….impressive!! Meanwhile, a huge Costa Rican flag waves at the National Stadium, known as the “Jewel of La Sabana,” the title given by former President Oscar Arias, but constructed by a force of entirely Chinese workers. 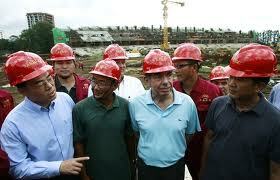 “Thanks to the immense generosity of the nation of China, this dream will be possible in a matter of months,” Arias said during the National Stadium ground breaking ceremony on March 12, 2009. “Today we lay down the first brick of a stadium that will be proportional to the passion of our nation; a stadium that will be the heart of our country, in the middle of the lung of the city.” Time will only tell how much this stadium will truly cost us, but for now…..we’re damn glad to have it!! 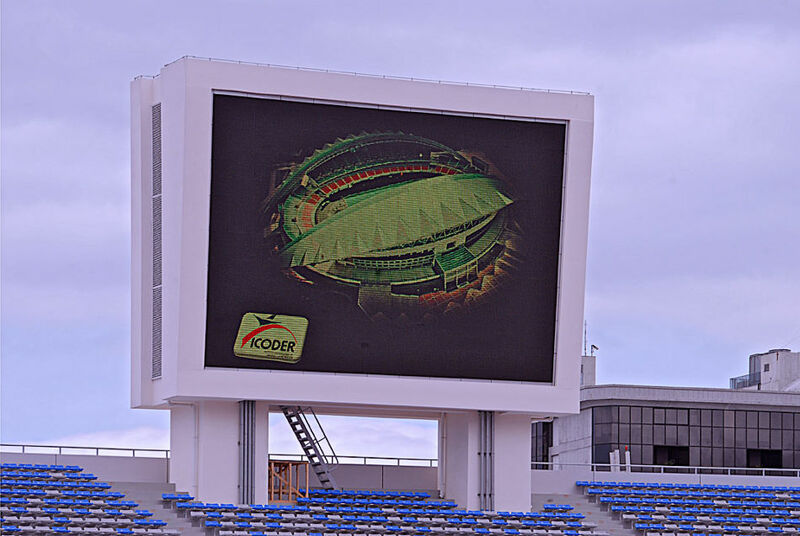 Costa Rica’s new National Stadium inaugural events kick off Saturday with the highlight being a friendly soccer match between Costa Rica and China. Here is a detailed list of the other exciting events scheduled over the next few weeks while we enjoy….. Stadium Fever! Saturday, March 26, official opening ceremonies begin at around 1pm. The highlight of the inauguration will definitely be the highly anticipated friendly soccer match between Costa Rica and China. The opening event also includes official “Acts of Protocol”, with speeches by Ex-President Oscar Arias, the Chinese Delegation and current Costa Rican President, Laura Chinchilla. There will also be a ceremony for top Costa Rican athletes that will receive special recognition for outstanding performances in their fields over the years, as well as a firework show to top off the night. Teletica will be covering the inauguration live on channel 7 from 3pm to 6pm. Tuesday, March 29, Costa Rica’s national soccer team faces rival Argentina in a friendly soccer match, featuring the world’s top soccer player, Lionel Messi. Wednesday, March 30, is a night of classical music. The program includes: Intermediate Symphony Orchestra, Youth Symphonic Band, Youth Symphony Orchestra, National Symphony Orchestra, and National Symphony Chorus. The event starts at 7 pm. Thursday, March 31 brings in boxing night to include some four Exhibition Matches and three World Championship bouts. The highlight of the night will undoubtedly be Costa Rica’s own boxing queen, Hannah Gabriels, who will defend her World Championship title. Friday, April 1 is time to put on those dancing shoes, grab a dance partner and get to the national stadium for a night of latin dance music. Thousands of couples will show off their dancing skills in a typical open-air dance event known as a Lunada. The organizers promise an unheard of “air-conditioned” ballroom, food sales, and participation of some of this country’s most popular musical groups to include: Los Hicsos, Los Originales del Chiki, Marfil, Calle 8, Banda Chiqui, Lubin Barahona and Los Caballeros del Ritmo, as well as Son de Tikicia..
Saturday, April 2 is live and loud music night with all the best musicians from Costa Rica, to include: Esteban Calderon, Le Pop, Marta Fonseca, Escats, Editus, Humberto Vargas, Maria Pretiz, Akasha, Time’s Forgotten, Dexnuke, Evolution, 424, El Parque, Ghandi, Cocofunka, Percance, Mechas, Pato Barraza, and many many more! Don’t miss it!! Sunday, April 3 features specially invited singers Victor Manuel, Gilberto Santa Rosa, and Don Amor performing all their greatest hits. Jump forward to Sunday, April 10 is the highly anticipated Colombian Superstar Shakira live in concert! This night guarantees to be vibrant, colorful and festive event for one of Costa Rica’s most popular pop stars. Now, if only everyone can figure out where to park! Only 500 hundred parking spaces were written in during the planning stages, and no one thought to do anything about that until now. Now that there will be some 35,000 people planning to attend the opening events! Say what?? Yes, you read that right! So plan to pay huge fees to park in surround homes and business’ yards, lots or anywhere that will fit a car. Otherwise, plan for long walks and confusing new bus schedules to get you in there. DO NOT plan to park in no parking zones. Local “transito” officers have already promised some 300 officers will be on hand directing traffic and writing parking tickets that will cost in the area of $400 per violation! I guess I will just stay home and watch this all on TV!! Pura vida!! Virtual Tour of the New Stadium HERE! !